BEIRUT (Reuters) - Lebanon's armed forces acquired three U.S. helicopters worth $26 million on Thursday to help in efforts to stop Syria's civil war spilling over its border, along with almost $29 million of British aid as EU countries also step up their support. 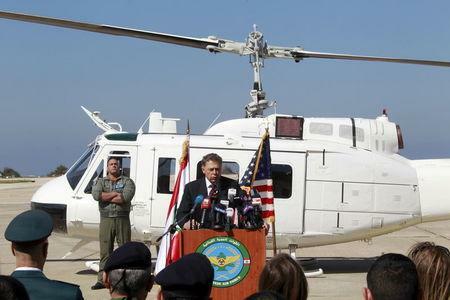 The Lebanese armed forces have now received a total of nine Huey II multi-mission helicopters from the United States as part of $1.3 billion in security assistance given since 2004, U.S. interim Ambassador Richard H. Jones said. "We have no plans to slow down or alter that level of support," Jones said at Beirut's military air base. Fighting between Islamic State and al Qaeda-linked Nusra Front militants often overlaps Lebanon's mountainous northern border with Syria, where a civil war is now in its fifth year. Fighters briefly overran the northern Lebanese town of Arsal in 2014 before withdrawing to the hills after clashes with the army. Fighting in the border area killed at least 32 Nusra and Islamic State fighters this week. The helicopters will improve the army's ability to quickly reinforce "remote areas of tension along the border in support of the army's fight against terrorists", Jones said. Lebanon has a weak government and a number of nations support its armed forces, concerned that regional conflict and a power struggle between Iran and Saudi Arabia could again destabilise a country which emerged from its own civil war 26 years ago. On a visit to Lebanon on Thursday, British Foreign Secretary Philip Hammond announced a further $22 million for border guard training through to 2019 and $6.5 million for general training of 5,000 Lebanese troops. "Lebanon is an important part of the front line against terrorism," Hammond said. "We are delighted by the way the UK support is being translated into strengthened border security and is enabling the armed forces to take the fight to Daesh and keep Lebanon safe from the incursions of Daesh," he said, referring to Islamic State. EU foreign policy head Federica Mogherini, who visited Lebanon last week, said that Lebanon's security was important for Europe's safety too and the EU was willing to expand its support for the Lebanese armed forces. In February Saudi Arabia suspended a $3 billion aid package for the Lebanese army in what an official called a response to Beirut's failure to condemn attacks on Saudi diplomatic missions in Iran. Lebanon's Iranian-backed group Hezbollah is also a significant military presence in the country, with extensive combat experience. It fought Israel in an inconclusive 2006 war and is supporting President Bashar al-Assad's forces in Syria.